We received word yesterday afternoon that two of the children in our orphanage have contracted cholera. But Edner, our Orphanage Director, acted quickly. The two children were taken to a hospital some distance away where they received treatment and are now recovering. Cholera causes severe diarrhea, which leads to dehydration. If fluids are not replaced quickly, this can lead to death. We thank God for protecting these children, for giving Edner the wisdom to respond quickly, for seeing them safely to the hospital, and for using the treatment to combat this infection. We also thank God for protecting Pastor Diogene yesterday! When Diogene first heard that the children in the orphanage were sick, he decided to make the four-to-five hour trip from Port-au-Prince to Tricotte to make certain that the children were receiving proper treatment and to help transport them to the hospital if necessary. So Diogene, a driver, and two helpers left Port-au-Prince and drove north. About an hour out of the city, Diogene used his cell phone to call Bernie to apprise him of the situation. In the middle of their conversation, Bernie heard sudden crashing and banging of metal and glass, and then the phone went dead. Bernie quickly called back and soon was able to reestablish a connection. A young boy had stepped into the road in front of the pickup. The driver swerved and missed the boy but lost control of the vehicle, which went into a ditch and rolled over three times! The Haitians who had witnessed the wreck told Diogene they were certain that everyone in the pickup was dead. But not only did all four survive, they were virtually unscathed. It was truly a miracle. Finally, we are grateful to God that Glenn has a firm diagnosis and has begun treatment for peritoneal tuberculosis, an uncommon disease that has infected his intestinal lining. The treatment lasts six months, but the long-term prognosis is good, and we are looking forward to the day when Glenn will return to Haiti with us. Incidentally, Glenn’s doctor does not believe Glenn contracted this disease in Haiti, but rather on a trip to India a few years ago. The team from Grace Community Church in Auburn, Washington, met early this morning for a breakfast of pancakes made by Bernie (something you can only experience in Haiti). After breakfast we set out for La Pointe, a two and a half hour trip north. There is a hospital in La Pointe that is run by the Union of Evangelical Baptist Churches of Haiti, an organization that Starfish Ministries partners with on occasion. The team spent time at the hospital touring the facility and interacting with patients and staff. After returning to Tricotte, the team split into two groups. One assembled bags of food that will be distributed by local churches in some of the poorer villages in the area. The other group built benches that will be used by another church. On Thursday morning the team from Grace Community Church headed for Peliter, a village that is home to one of the Starfish Ministries schools. Across the road from the school is a church where the team set up a projector and a screen and blocked out the windows with dark fabric, creating a temporary movie theater. Then we invited the children from the school to join us for a screening of the Jesus Film. After watching the film, Pastor Diogene asked the children if they thought it was fair that Jesus was punished like he was. They responded that no, it was not fair. So he explained to them that Jesus had taken their punishment, so that they would not need to be punished for their sin, and could spend eternity in Heaven with Him instead. Then he asked how many had made a decision to follow Jesus. The majority raised their hands, but one young girl, perhaps 14 years old, did not. Diogene asked her if she would like to trust Jesus, and she said she would. She came forward, and the team gathered around her and prayed with her. Later we found out that her father is a witch doctor, and her family is heavily steeped in voodoo. It’s difficult to say how her family will respond to her decision — they may throw her out. But Pastor Diogene has already taken steps to support her through whatever happens, using the pastor of that local church and committing to stop to check on her regularly himself. After packing up the projection equipment, the team went across the road to the school where they handed out gifts that had been prepared for the school children by North County Christ the King Church in Lynden, Washington. Each student received a package that included school supplies, small toys such a stuffed animal or a doll, candy, hair accessories, and other items. Then we drove to the Starfish Ministries school in the village of Ravine and distributed gifts to the children there as well. All tolled, nearly 250 children received gifts today, although none received a gift so great as the young girl who received eternal life when she met her savior today for the first time. 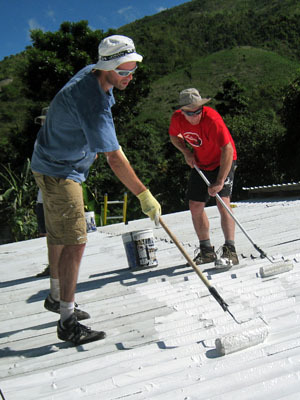 John Howard (left) and Paul Martain apply Snowroof to the the roof of the girls' dormitory. The men from Grace Community Church got on the roof early today to try to beat the afternoon heat. They applied Snowroof roof coating to weatherproof the girls’ dormitory at the orphanage. While the men were working to keep water out of the girls’ rooms, the women from Grace Community were conducting a health and hygiene class for the girls. 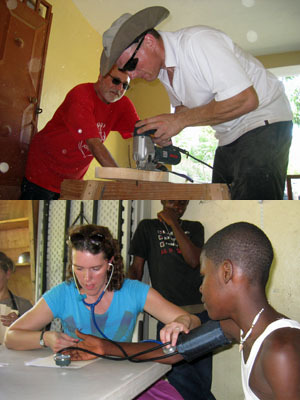 Paul Martian and John Choukalas cut out pieces for benches (above); Mechelle Ambugey takes an orphanage boy's blood pressure (below). We arrived in Haiti on Sunday with a team of eight from Grace Community Church in Auburn, Washington. After attending the evening service at Pastor Diogene’s Port-au-Prince church, we spend the night at Mephibosheth Children’s Home, an orphanage for handicapped children. On Monday, we made the six-hour drive to Tricotte and joined the orphanage children for their evening devotions. Tuesday, our first full day in Tricotte, we got busy. The men — John Choukalas, John Howard, and Paul Martian — started on the roof of the girls’ dormatory. We will be installing a coating over the metal roofing this week, and the first step was to clean the roof. So the men spent the morning hauling water up a ladder and scrubbing the roof with brooms. In the afternoon, the men retreated to the relative cool (and it’s very relative) of the shop where they worked building benches that will be used for the Tricotte Church. 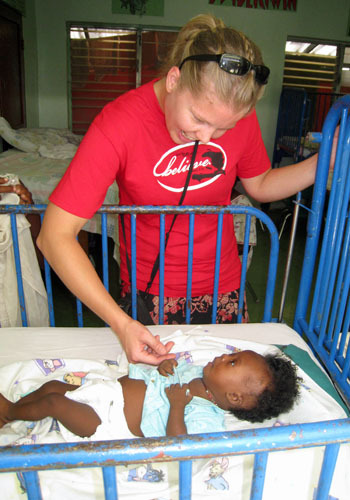 The women, meanwhile, conducted a clinic at the orphanage where they gave each of the children a simple physical. Nurses, Mechelle Ambugey and Aimee Thomas checked vital signs and tended to any obvious issues while Ceil Choukalas, Lianne Arakaki, and Julie Williams checked height and weight and gathered other information. The evening before we left Tricotte a few weeks ago, Bernie, Dave, and I were invited to a party at the orphanage. The results were in for the standardized tests that every Haitian student takes at the end of each school year, and the children at the orphanage had done extremely well. To say that they did extremely well was even an understatement. 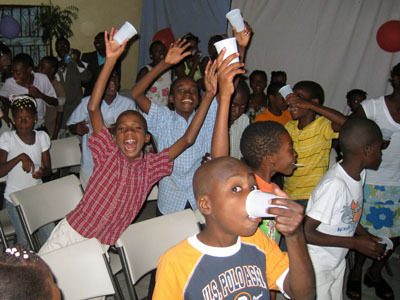 Every single student had passed his or her test, and that is unheard of in Haiti.